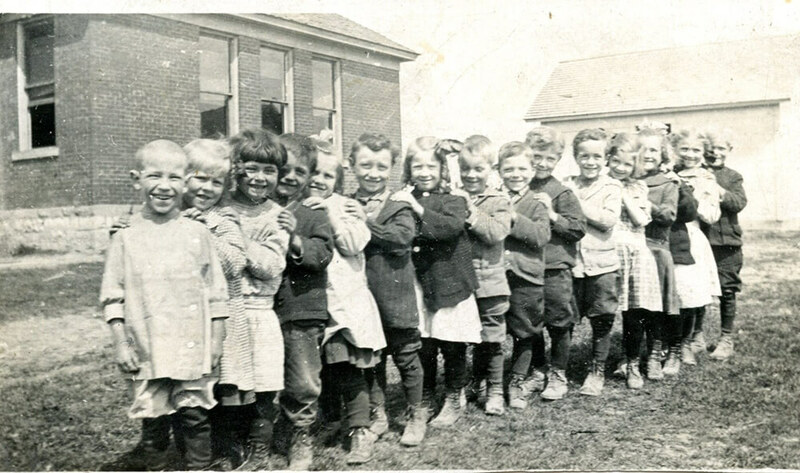 Around 1912, 15 smiling young students line up for this cheerful photo taken near the second Bedell School (est. 1900), located about halfway between Fraser and Mackinaw roads, in Kawkawlin Township, Bay County. Students include (L to R) Owen Noice, Lucy Goss, Lena Goulet, John Hartley, Ethel Paige, Wesley Hartley (Ted), Iva Bedell, Floyd Bedell, John Fontaine, Harold Friebe, Wilfred Hartley, Agnes Trelewski, Blanche DuBuois, Gertie Bedell, and Lawrence Friebe. The two-room, red brick, rural grade school pictured replaced the first wooden Bedell School (1868-1900) that was destroyed by fire. A Bay-Journal.com article describes the Bedell area as a hamlet located at Beaver and Mackinaw roads in Kawkawlin Township, Bay County, with a 1910 population of 70 people, two stores, and an I.O.O.F. (Independent Order of Odd Fellows) hall. Kawkawlin Township was organized in 1868, when “an influx of farmers” began to clear the land and settle, explains author Odeal L. Sharp in Country Schools of Bay County, Michigan 1839-1970 (2007). By 1883, six school districts (Bedell, Brisette, Town Hall, Ott, Cottage Grove, and Linwood Village Schools) were established in Kawkawlin Township. Warren was established later. The Bedell School closed in the late 1950s. Photo courtesy of Mary Hacker, Bay City, with names provided by Nancy Humphrey, Midland.